1. Global market overview: Market sentiment has recovered from the shock news that the United States would not hold a June 12 summit with North Korea to discuss its nuclear weapons program. Stocks dropped Thursday, and then recovered to close little changed. The Dow Jones industrial average ended down by 0.3% and the S&P 500 was off by 0.2%. The Nasdaq was flat at the close. 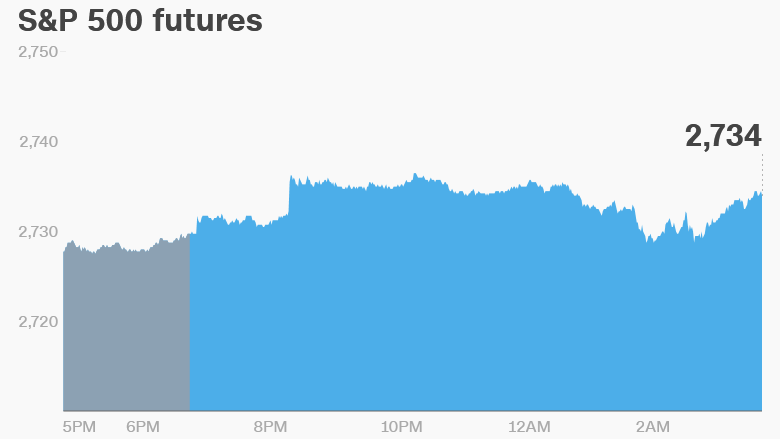 US stock futures were inching higher on Friday, and European markets were mostly rising in early trading, with some key markets up by 0.5%. Investors were a little more cautious in Asia, where some stock market indexes closed the day with narrow losses. 2. More drama at Samsonite: The world's biggest luggage maker Samsonite has fired back at an investment firm that accused it of questionable business practices, but its response failed to reassure shareholders. The company's stock plummeted by about 12% in Hong Kong on Friday following a 10% drop the day before. Samsonite (SMSOF) came under fire Thursday from Blue Orca Capital, a new firm led by renowned short seller Soren Aandahl. Short sellers are investors who profit when the value of a company's shares drops. Samsonite said the allegations were "one-sided and misleading, and accordingly, the conclusions drawn in the report are incorrect." It warned shareholders to treat the Blue Orca report with caution, as "it may be intended specifically to undermine confidence in the company and its management, and to harm its reputation." It said it believed it had no information it needed to disclose to investors under Hong Kong securities rules. 3. Rusal retreat: Russian oligarch Oleg Deripaska is taking another step to distance himself from his massive aluminum company that's reeling from crippling US sanctions. Rusal, the world's second largest aluminum producer, said in a statement Friday that Deripaska, its founder, had stepped down from his role as a non-executive director on its board. It said the decision was taken in order to "protect the interests of the company and its shareholders." His departure follows those of the company's CEO and seven other directors, which were announced Thursday. Rusal, which produces 7% of the world's aluminum, has been under intense pressure following the imposition of US sanctions, which targeted a number of oligarchs and government officials, including Deripaska. The sanctions were designed to punish Moscow for meddling in the 2016 US presidential election. The US Treasury Department said last month it would consider easing sanctions on Rusal if Deripaska divests. 4. New privacy rules in Europe: The highly anticipated privacy revolution has arrived in Europe. The General Data Protection Regulation (GDPR) came into effect across the European Union on Friday, changing the way companies around the world collect and handle personal data. The new law affects any organization that holds or uses data on people inside the European Union, regardless of where is it based. An Indian call center handling customer services for companies that sell products in Europe or a US website tracking browsing histories of Europeans will be impacted. The last few days were marked by a huge scramble among businesses to get their data privacy policies in shape. Those who fail to comply could now face fines of up to €20 million ($23 million) or 4% of their global annual sales, whichever is bigger. Privacy advocates have already filed legal complaints against Facebook (FB) and its Whatsapp and Instagram subsidiaries, and Google (GOOGL), alleging they are breaking the new rules. 5. Earnings and economics: Buckle (BKE) and Foot Locker (FL) are the key companies releasing earnings before the open Friday. In economics, the University of Michigan is releasing its monthly consumer sentiment survey for May at 10 a.m. ET. In the United Kingdom, the Office for National Statistics reiterated that the economy grew by just 0.1% in the first quarter of 2018 compared with the previous quarter. Some economists had been expecting the number to be revised higher because the preliminary report was based on partial data.